The thought of rest is one that seems all too elusive in today's lightning-speed culture of news, technology, work, demands of daily duties, children's activities and even church commitments, especially during the holidays. It's ironic. The reason for the season is Jesus, yet through the holidays, actually setting time aside with Him can feel impossible. Even before the days get going, turn the technology off and open a devotional book such as Ann Voskamp's Unwrapping the Greatest Gift. This season might even ignite a new passion in your own desire to usher in His presence even beyond the Christmas season. 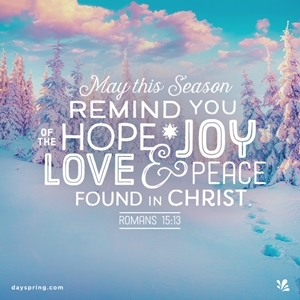 Check out DaySpring’s Advent Section to find more resources, books and devotionals to help guide you through the Advent season. Between Thanksgiving and New Year’s Day, it seems there’s a holiday event every day. Often we feel obligated or compelled to attend each one, regardless of the holiday stress we may be feeling. Ask the question, “What if I don’t go? What will happen?” When we’re honest with ourselves we realize that we may not be missed. We need the downtime to better serve the Lord and others. Before Thanksgiving, take out the calendar, mark three must do events (the children’s Christmas play, for example). Now mark at least three “reset” days and don’t make any plans for that day. Put away the electronics, put phones on silent, and take some time to be secluded and rest and rejoice in the season. Avoid these becoming prep days, and be amazed when you see what happens with the rest of your time. Instead of filling the reset days with activities, fill the days with peace. We’ve all seen people sitting together but not with each other, gathered yet looking down at some kind of device, tapping away to someone else. Make those invited to your holiday event aware that your gathering is “Unplugged.” Honor each other and the time spent together enough to stow the gadgets in a basket at the door with the sound on silent. Assign one iPhone photographer and after the event, compile all the photos taken and send them to the attendees after the event. Talk, laugh and enjoy the moment. Leave some cute notepads and pencils accessible in case someone must jot a note or reminder! Yes, some of us live across the country from our parents and grandparents. If you can make the trip at Thanksgiving or Christmas, awesome! Travel can be the best gift for any occasion. However, visiting for the holidays may not be possible. There are some grandparents in your area whose family can’t get to them either. Many of these folks live in assisted living facilities and welcome a happy face. When we take our children or grandchildren to visit those who may be alone, we brighten the day of someone else and many times, it can slow our pace as well. Lest we forget, this is a holy season to celebrate the Light and Peace coming to the world. We must allow ourselves to rest in order to find holiday stress relief. It’s important to be still. If our priority is truly to celebrate the coming Messiah, then let’s invite Him to guide and guard our steps this season. Turn off, tune out, look up. Turn off the calendar, the phone, the games. Turn on conversation, hugs, and fun. Tune out the “must dos.” When the family is getting harried and cranky from the holiday stress, it’s time to RESET from the demands of the season by finding rest in Jesus. Look up and embrace the peace and rest in the reason for the season—Jesus Christ, Emmanuel. Turn off, tune out, look up.